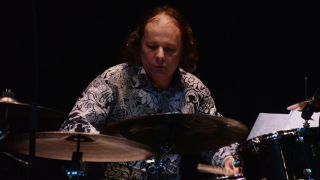 Wembley Drum Centre has announced Ralph Salmins for the next Live and Sticking event. The seasoned sessioner will put on a masterclass at the store on June 26. It kicks off at 7pm and entry is absolutely free. And that's not all, Pink drummer Mark Schulman will be at the University of Westminster for a show put on in conjunction with Wembley Drum Centre on 31 July. More information can be found at www.wembleydrumcentre.com. The store recently welcomed Pete Ray Biggin, here's a clip from the PB Underground/Level 42 man's performance.